The City of Copenhagen minds the gaps. Over the past decade, we have witnessed radical changes in the connectivity of Copenhagen, a city bisected by a harbour. We’ve watched as thirteen bridges have popped up (with four more on their way), connecting previously cut off neighbourhoods while facilitating a 13 km recreational path, the Harbour Circle. Mobility and bicycle user experience are both high priorities on the City’s agenda, and these bridges are only a part of a greater plan. But most notable of all, each and every one of these new bridges are off-limits to automobiles, saying loud and clear that this is a city for people. A Life-Sized City. 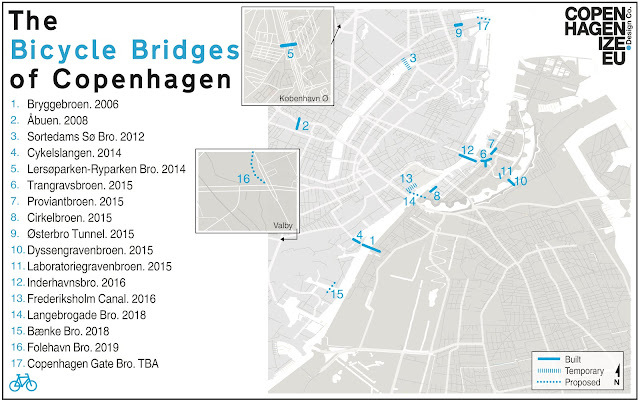 To show how serious the city takes connectivity, we created a map showcasing the new and upcoming bicycle bridges of Copenhagen. The map above is divided into three categories: the built, the temporary and the proposed. The ten already built are currently in use by those looking for a fast A to B. Bridges are the mobility link inside the urban toolbox that effortlessly solves the problem of crossing an obstacle. Done properly, a bridge is A-to-Bism at it’s finest. The significant number of bridges is immediately noticeable on our map. While thirteen new bridges for bicycle users and pedestrians have opened since 2006, nine of of them were built in the last two years alone. Completed in 2006, Bryggebroen was the first new connection built over the Copenhagen harbour in centuries. Bryggebroen served to connect Havneholmen to Islands Brygge and beyond, giving Copenhageners a much needed connection over the harbour. However, crossing the bridge into the city, riders were forced to choose between two inconvenient options: to push their bicycle up steep stairs, or take an inconvenient, indirect, detour weaving through pedestrians. This gap was filled with the addition of the Cykelslangen, (The Bicycle Snake), in 2014. Cykelslangen is an elevated, orange bike lane, elegantly connecting Bryggebroen to the neighbouring districts, along a dedicated, bicycle only pathway. Shortly after opening, Cykelslangen became an instant Copenhagen urban icon for it’s practical, elegant and functional Danish design. At last count, the two bridges accommodated 14,200 and 12,700 daily bicycle riders, respectively, far exceeding traffic flow predictions. These two bridges set a new standard, bicycle bridges are not only widely popular among residents and visitors alike, but an incredible investment. Bryggebroen (upper) and Cykelslangen (lower) connecting neighbourhoods. Photo: Ole Malling. In 2009, we wrote: “What the city needs is access across the harbour farther east, closer to the city centre on the Inner Harbour. Our new Opera and the former military area called Holmen, would benefit greatly from increased access. A network of bridges is needed.” The City took note of these gaps and seven years later the results are in. With four new bridges in the area, Holmen is now better integrated with the rest of the city in all directions. Urban acupuncture at it’s best. 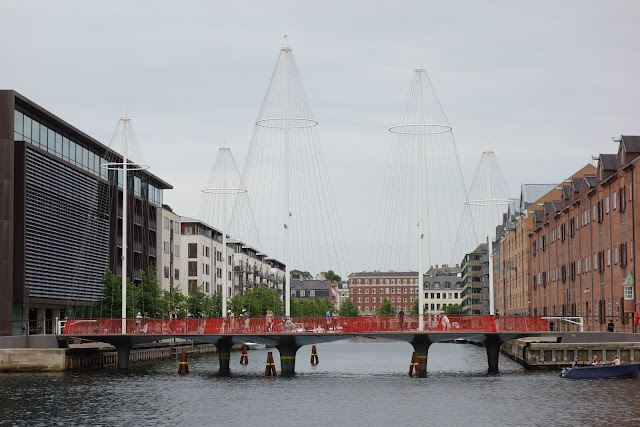 The Inderhavnsbro (AKA the Inner Harbour Bridge, AKA the kissing bridge, AKA the missing bridge), connecting Holmen to Nyhavn, Kongens Nytorv and beyond, opened just three weeks ago, with an already noticeable effect on pedestrian and bicycle flow on Holmen. 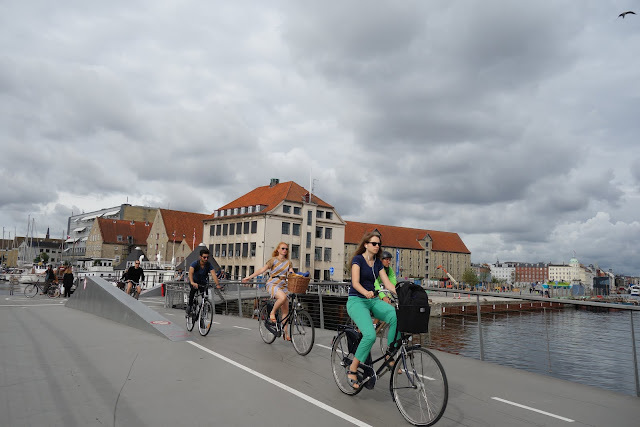 In addition to the Inner Harbour Bridge, Trangravsbroen and Proviantbroen, have made it easier, faster and safer to move on foot and by bicycle across Holmen and Christianshavn. The new Inderhavnsbro connects the city centre with Holmen and beyond. Trangravsbroen conveniently connects three corners of the Holmen district. Shorter bridges over 17th Century canals, such as Cirkelbroen (the Circle Bridge), and the Frederiksholm Canal bridge, help link almost the entire harbour. Designed by the Danish-Icelandic artist, Olafur Eliasson, Cirkelbroen opened in 2015 and fixed a minor, but important gap in the mobility network of Copenhagen. This beautiful, but modest bridge connects Christiansbro with Applebys Plads and accommodates 2,200 bicycle users daily. Even smaller bridges, less decorated bridges, like Dyssegravenbroen and Laboratoriegravenbroen bridge in Christiania and the Lersoparken-Ryparken bridge also have a big, positive impact on A-to-Bism. The Dyssegraven and Laboratoriegraven bridges are new connections from eastern Amager into the city. While we were biking through Dyssegraven, we stopped and asked a local for his thoughts on the bridge: “It is part of something big. Copenhagen does a lot for cyclists and pedestrians to get around.” We couldn’t agree more. Olafur Eliasson's Cirkelbroen, inspired by a harbour full of sail boats. It’s easy to see the need for bridges in a maritime city like Copenhagen, but the City’s efforts to connect the urban fabric doesn’t end at the harbour’s edge. Bridges and tunnels also connect bicycle riders to areas previously cut off by busy roads, railways, and construction sites. The bridge between Lersoparken and Ryparken was completed in 2014, allowing for pedestrians and bicycle users to cross between two parks and neighborhoods while avoiding indirect and busy roads. 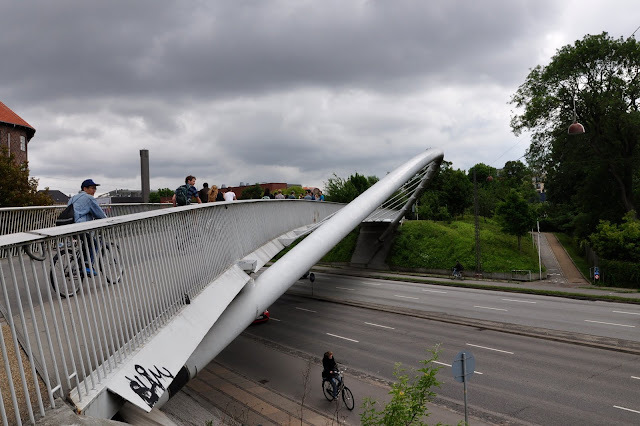 Åbuen, opened in 2008, eliminated the challenge for bicycle users approaching and exiting the road bordering between Nørrebro and Frederiksberg. Folehaven Bridge will connect and ensure a safe passage between the Vigerslev park and the Folehave area over the rest of Valby. This bridge will help bicycle users avoid the major traffic barrier that is. 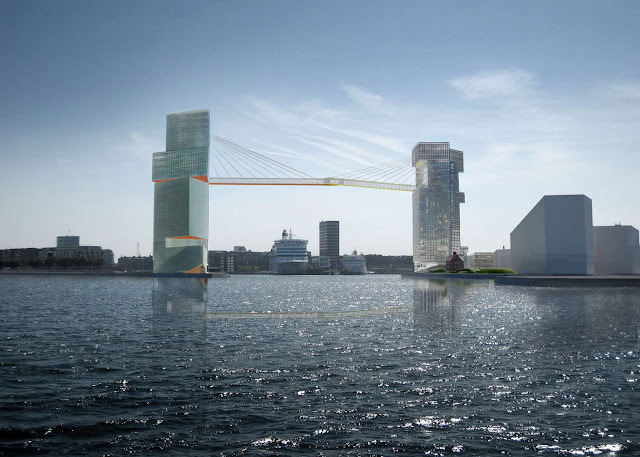 The bridge will be located at the municipal boundary and with it’s design it will serve as a dramatic welcome to the city of Copenhagen, reminding automobiles that bicycles are above them. The city is currently developing two new metro lines, creating inconvenient detours to get around. Two temporary bridges symbolize the commitment of the city to cyclist mobility and not strictly on construction efforts. The Sorted Lake bridge is a new way of experiencing the picturesque lake through a floating shortcut, since the Metro expansion has reduced some of the regular gravel paths next to the lake’s shore. Once the expansion of the Metro is over in 2018, the paths will be back to normal and the floating bridge will be eliminated. 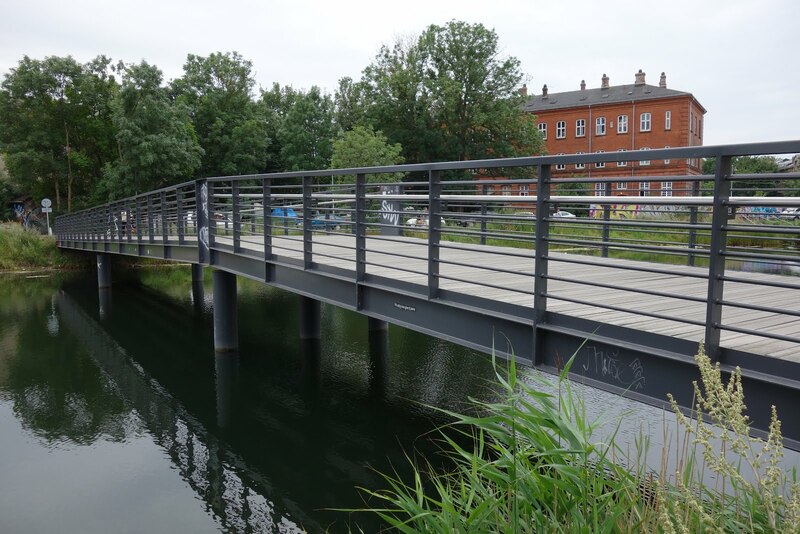 Another temporary bridge over Frederiksholms canal was put in this year to give pedestrians and bicycle users the opportunity to bypass the construction of Blox, the future home of Realdania and the Danish Architecture Centre. Without this temporary bridge, one can be strolling down the southern Frederiksholms canal and end up at a dead end forced into relatively fast automobile traffic. If you are on the north side, you must return to the Prince's Bridge near Christiansborg Show Grounds. And lastly, we have a tunnel. 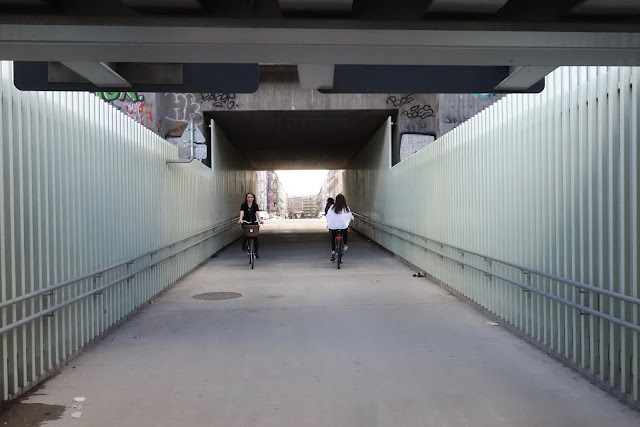 The airy, well-lit Østerbro tunnel opened last year, addressing a major barrier separating residents and bicycle users from Nordhavn and the waterfront. For businesses and residents on Marmormolen, Amerika Plads, and in Århusgade, this tunnel cuts a significant portion of the transportation time welcoming 2,700 bicycle commuters each day. The four proposed new bridges will all further develop the accessibility of the central part of the city and the harbour. Langebrogadebro will connect Vester Voldgade and Langebrogade in Amager and is expected to be completed in 2018 as part of Realdania’s Blox development. 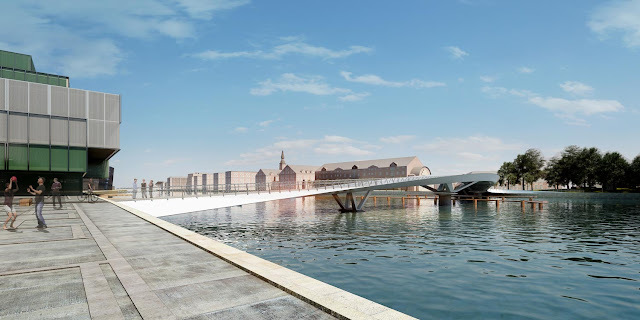 The bridge will become part of the green wave network or ‘Grøn Bølge’ that will relieve both car and bicycle congestion of Langebro and Knippelsbro. As part of Realdania's BLOX development, the foundation has announced Langebrogadebroen, a new pedestrian and bicycle bridge over the harbour. 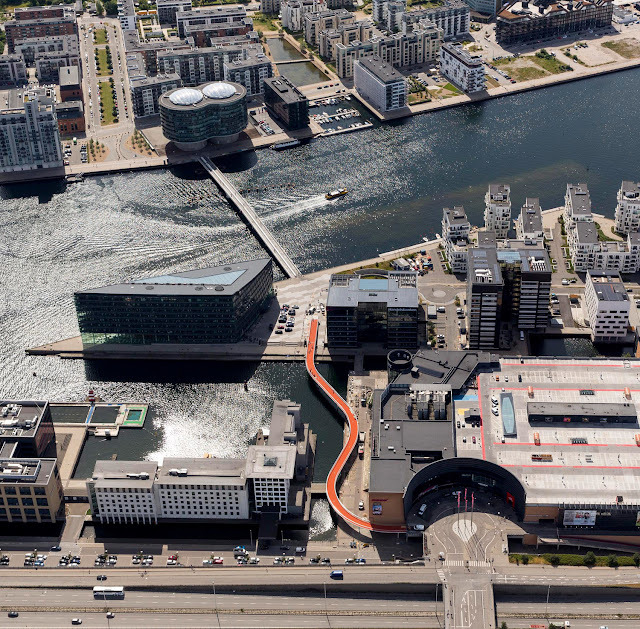 Bænkebro (The Bench Bridge) will connect Teglholmen and Enghave Brygge, in 2018. The residents of these two areas are currently forced to take a very busy and tedious detour along Vasbygade to commute to and from the city centre, which can easily diminish the desire to commute by bicycle. The new, upcoming Bænkebro will be a nice shortcut through the harbour with less noise and nicer scenery. Once finished, it will be easier to ride all the way down the south harbour connecting the newly developed area at Sluseholmen, and the upcoming commercial and residential area at Enghave Brygge, to the rest of the city.